Working on his boat Tuesday, Doug Larime pauses because I’ve interrupted him. So I could ask him about his boat, Doug Larime was kind enough to stop what he was doing, which was removing a layer of old varnish from the inside of the hull. That’s not a quick or easy job, as you well know if you’ve ever tried it. What about the boat? It’s a Penobscot 17, an East Coast-type of craft designed by Arch Davis Design in Belfast, Maine. Doug built it about five years ago in the garage of the Larime home. Took him about a year, he told me. Doug Larime is retired after a career as a professional photographer. He’s also worked as a machinist. His wife, Carolyn, is active in the Willamette Community garden a couple of blocks from their home. I asked about the rig. The boat is gunter-rigged, meaning it has a relatively short mast but a long gaff-like spar that rises above the mast to hold up the peak of the triangular sail. The rig allows the mast to be short enough so that it, along with the spar and boom, can be stowed inside the boat. 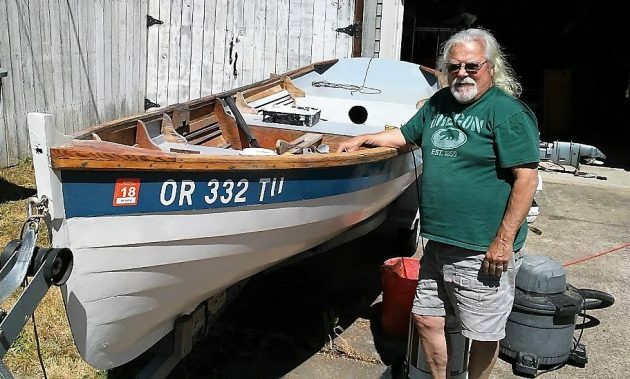 Doug has sailed the boat on the coast, on Yaquina and Alsea bays, but mostly he takes it to Foster Lake near Sweet Home. He’s tried Green Peter, but the mountainous terrain there makes for fluky winds, not convenient for small-boat sailing. Appreciate reading about Albany area news while traveling this week in England. Your site is available on the internet. Can say the same for the Albany Democrrat-Herald’s site.